We are happy to hear from you! To reach our Choristers Guild staff, please email us at contact@choristersguild.org. If you are inquiring about an invoice or membership, please include your account number and/or invoice number. For license or permission requests, please visit our licenses and permissions page. New Composers: Sacred Choral Submissions - Electronic submissions only. Please email PDF or Finale files to Katie Houts at khouts@choristersguild.org. Please include recordings, if available. *Please only send your best 1 or 2 pieces. Allow 6 months for your submission to be processed. New Composers: Sing! 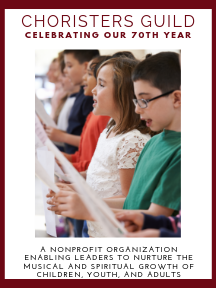 Educational Choral Submissions: - Electronic submissions only. Please email PDF files AND Finale or Sibelius files to Mary Lynn Lightfoot at mlightfoot@choristersguild.org. Please include recordings, if available. *Please only send your best 1 or 2 pieces. Allow 6 months for your submission to be processed. Electronic submissions only. Please email your Finale manuscript (or PDF and Midi files) to Kathy Lowrie at klowrie@choristersguild.org. Please include recordings, if available. *Please only send your best 1 or 2 pieces. Allow 2-3 months for your submission to be processed. Electronic submissions only. Please email PDF or Word files to Susan Eernisse at seernisse@choristersguild.org.